LOS ANGELES (AP) — With the confirmation of Supreme Court nominee Judge Brett Kavanaugh in doubt, Justice Elena Kagan discussed how the court worked “super hard” in the past to overcome the unusual scenario of a 4-4 split it is due to encounter next week. 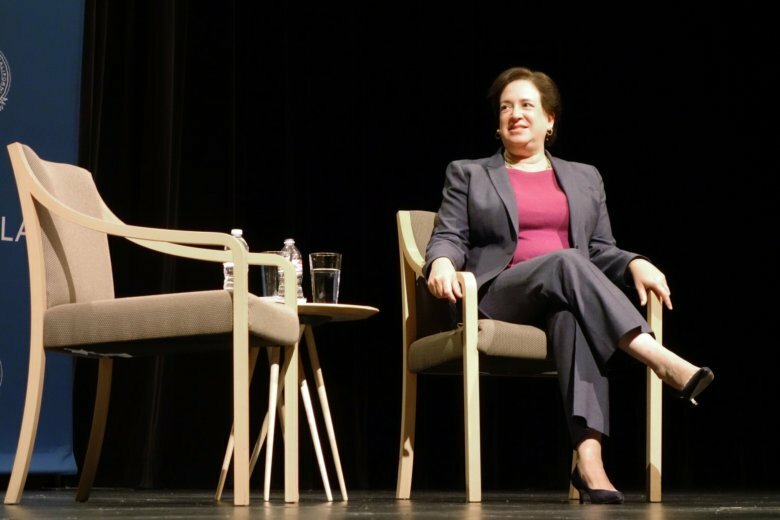 Kagan declined to comment on the nomination, but she spoke at length Thursday to law students at the University of California, Los Angeles, about the challenges the court faced the last time it had only eight members and lessons learned from that experience. Kagan said the justices worked to find consensus after the death of Antonin Scalia in 2016 temporarily left the panel with only eight judges — and the prospect of being deadlocked on divisive issues. The court is scheduled to reconvene for oral arguments Monday one justice short following the retirement of Justice Anthony Kennedy earlier this year. Kavanaugh’s nomination, which could tip the nation’s highest court to a conservative majority, has been in doubt since several women accused him of sexual misconduct early in his life. The Senate Judiciary Committee recommended on Friday that the full Senate confirm Kavanaugh, who has aggressively denied the allegations. The full Senate was scheduled to vote Tuesday on Kavanaugh, who currently sits on the District of Columbia Circuit Court of Appeals, though that could be scuttled if a lengthier investigation is launched into the allegations against him. Kagan, who Kavanaugh cited in his remarks before a contentious hearing Thursday for hiring him to teach at Harvard Law School, refused to answer a student’s question about the nomination process. But in remarks ranging from career advice to her amusement at John Oliver’s spoof on the “Last Week Tonight” show of dogs sitting in for Supreme Court justices (“It’s worth watching once,” she quipped to big laughs), Kagan addressed the far more serious issue of how the court confronted an even split between the liberals and conservatives on the bench. She said justices engaged in lengthier discussions at the time and even worked on finding agreement on smaller points when they couldn’t settle the larger issues at stake. The court had a handful of 4-4 decisions, including a deadlock in 2016 in United States v Texas where an equally divided court allowed a lower court injunction to stand that blocked President Barack Obama’s Deferred Action for Parents of Americans immigration program. “The court’s strength as an institution in American governance depends on people believe in it having a certain legitimacy … that it is not simply an extension of politics,” she said. This story corrects the spelling of Kavanaugh.